spicy baked eggs with potato & prosciutto. christmas morning breakfast is served. my family generally has cinnamon rolls for breakfast on christmas morning, but these little baked eggs are a scrumptious savory option, in individual servings to boot! beneath the happy little egg sits a layer of crispy red potatoes, a creamy mixture of plain greek yogurt and sharp cheddar, and spicy chile slices. this is all enveloped in a hug of prosciutto, sprinkled with sea salt, black pepper, and chives. 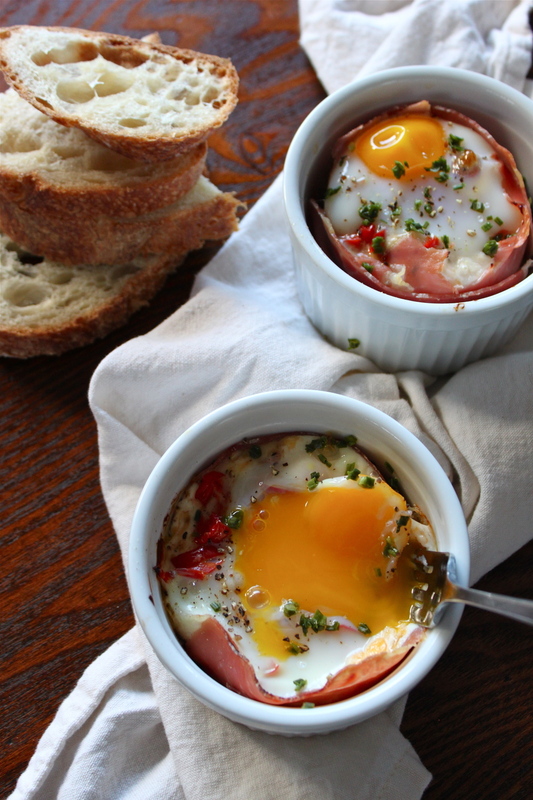 these baked eggs are deeeelicious, hearty, and satisfying. once you have all your ingredients prepared, they are super easy to assemble. if you have your potatoes cooked in advance, you could put these together in about 15 minutes before baking. i'm into that! this recipe is adapted from one of the most beautiful cookbooks i have ever laid eyes on. everyone must know about it. one of my old roommates, eva (who has an awesome life lately, sailing all around cooking on a sailboat while the captain leads photography classes, between other amazing travels & adventures) had a copy of this book, what katie ate. i would just sink into the couch on a rainy day and pour over every page. it is amazing. every rustic and cozy detail makes me want to jump inside and live in katie's kitchen. 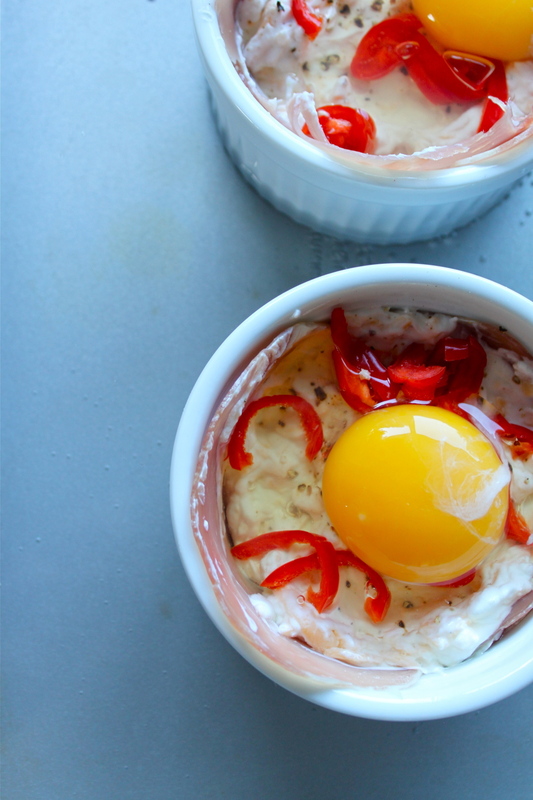 i made these baked eggs once last year and they were a winner. they're pretty heavy, so i decided to try using plain greek yogurt in place of the heavy cream it regularly calls for in the base. i was a little hesitant to put yogurt in the oven, but pete and i both thought it worked well. just dunk some crusty toasts into that spicy egg tater goodness, and all is right in the world. these are so tasty and pretty simple to make. 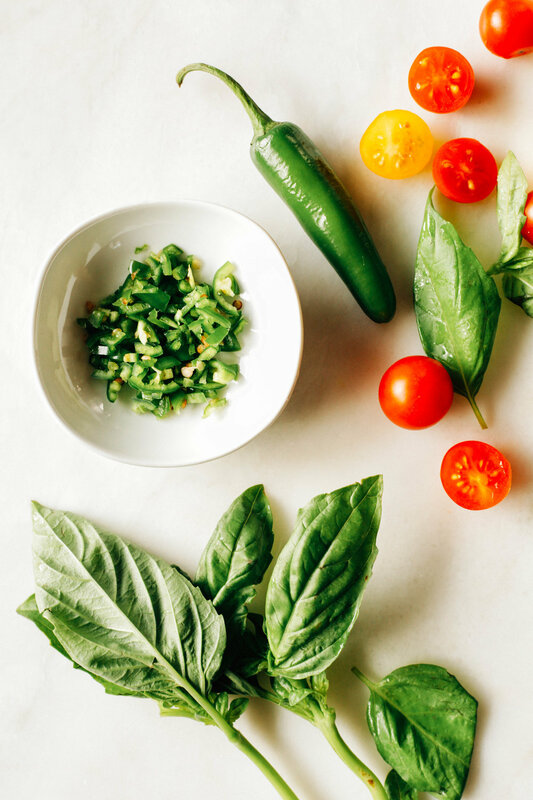 you might have most of these ingredients in your kitchen already! the individual servings are great, too. one ramekin is super filling. you can multiply the recipe depending how many people you'd like to serve. i'm always slightly sketched out by egg whites, but enough time in the oven will cook these all the way through. i'd highly recommend having some crunchy slices of toast to serve alongside this for dipping/scooping, but you can eat it on its own, too. the prosciutto holds everything together and gets wonderfully crisp on the edges. this meal has a variety of textures going on, and i love that about it. i probably would not make this if it weren't for the crunchy potatoes and crispy prosciutto that you get in each bite. the spicy chile really brings all the flavor together, too. even just a little bit of sliced chile in here gives the whole thing a good amount of heat. what i used here is actually a jalapeño that had been drying for a couple of months. green jalapeños turn completely red after a while! have you seen that before? crazy little chameleon. such a lovely little savory morsel! you could make this alongside those cinnamon rolls that i mentioned if you simply cannot choose between sweet & savory. just allow enough time for a christmas cat nap, of course. Boil a pot of water with a dash of salt. With a slotted spoon, add the washed potatoes to the boiling water. Simmer on medium-low heat for about 20 minutes, until the potatoes are just tender. Strain the potatoes and let cool. Slice into 1/4 inch rounds and set aside. This step can be done a day in advance to speed up the preparation process. Heat 1 tablespoon of olive oil in a skillet on medium heat. Add the sliced potatoes and allow them to brown, flipping with a spatula every 2-3 minutes. When they are golden and lightly crisp, remove from the skillet and set on a paper towel to drain the oil. Grease 2 medium sized heat-proof ramekins with olive oil. Place a couple of layers of fried potatoes at the bottom of the dishes, then line the inner circumference of the ramekin with a few torn slices of prosciutto. In a bowl, mix the Greek yogurt, shredded cheddar, salt and pepper together with a spoon. Divide the mixture into the two dishes and add the sliced chile or jalapeño on top. Add a sprinkling of extra shredded cheddar. Carefully crack an egg into each dish. Place the ramekins in a baking dish, brownie pan, or casserole dish. Pour water into the pan until it comes half-way up the sides of the ramekins. Bake for about 20 minutes until the egg white has set, and the yolk still looks partially runny. CAREFULLY remove the baking dish from the oven. It is going to be SOO hot. Place each ramekin onto a pot holder, plate, or kitchen towel. Garnish with fresh chives and extra black pepper. Serve immediately with rustic bread or crunchy toast.